Round 23, week of the Prelims! Heaps in this week’s edition – I won’t even go into it here, it would take too long! Get in and let rip in the comments – we want to get as much conversation as possible going for the Final Round of 2011! Just a disclaimer – I make no apologies for the length of this article. There is a lot to get through, and I assume if you’re all here, you’re keen for a good read! Enjoy. Round 23 and the Preliminary Finals threw in more than a few surprises. Late withdrawals, substitutions and disappointing scores were the flavour of the week. We are starting to see the finals-like intensity most games, and it’s even starting to creep into the more listless games, such as the West Coast vs Brisbane and Essendon vs Port games. As a result, we are seeing the scoring decline with the increased pressure. If you dodged most of the bad luck this week 2300 was attainable, but overall par was around 2200, which would have had you in the top 15,000 for the round. And of course, the Prelims were all knockout finals, so hopefully you were able to scrape together a win and are still up and running for this week’s Grand Finals! Just a quick shout-out to Roy and Chook, who did the DT Talk stable proud and won their respective matches in the All-Stars League! Chook won easily, helped by a unique Nick Riewoldt and a well-oiled forward line and consistency across the board. Maxy was the unlucky victim of Sam Mitchell’s late withdrawal, having no cover, while leaving Lower on his backline bench and fielding a poor effort from Brent Harvey. Harf (of Harftime SEN fame) has been great all year, but was unlucky to come up against a rampant Roy, who is into yet another Grand Final. Rockliff and Riewoldt were Roy’s uniques who stood up, while Harf was forced to play David Swallow to cover Murphy’s bye. An all-DT Talk Grand Final? Oooooh Yeaahhh! Trading in finals is a delicate art. Sometimes trading in the best player is not the best trade – sure, they’ll score the most over a large period of time, but for only one or two matches remaining, it’s a free-for-all. This is where luck comes into it. As a whole, we Dream Team coaches copped the bad end of the stick with our trades this week. Below is a graphic showing the most popular trade-ins as of lockout. Not a bad bunch of players… But how did they go? Excluding the 2nd gamer Tutt, the 10 most traded in players collectively scored, on average, just over 10 points less than their yearly average. 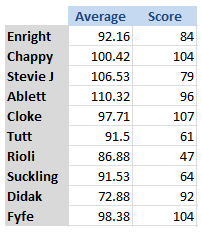 Of those players traded in, you would only really be happy with Didak’s continued return to form, and you’d take Cloke’s and Fyfe’s efforts. The rest were ordinary – let’s hope our research and knowledge pays off with this week’s trades. At this stage of the game, you’re one of two coaches. You’re either the coach who’s has a great team, coming up against a weaker opponent, and all you need is for your players to deliver what they have all year – it’s yours to lose. Or you’re the coach that, when you look player-for-player against this week’s opponent, is a little pessimistic about your chances. You, by no means, are in the favourable position, and you need a few things to go your way. The Knyfe is as consistent as they come. He has scored between 90 and 110 in 10 of his last 11 matches – the kid is a robot. Consistency is what this half of RedRock is all about. He has scored 119, 111, 118, 117 and 113 in his last 5. Notice a pattern? He’s been super-consistent all year, why stop now? He hasn’t scored under 86 since Round 3 – that’s a sure thing if there ever was one. Sam has said he’s a certain starter for this week, which means he’s a sure thing for you if you don’t have him! Disappointingly, he ended his 11 game streak of 100+ point games in his last… with a 96. Solid! What’s that? You want consistency with a high ceiling? Rock’s your man! 10 tons on the trot, and still going. You really need that edge this week… The only way you’ll win is by whipping something special out of the hat. A unique captain is a great start, but you really need to bring in someone who can do that something special. But who? He’s the best big-game player in the league. He has a higher ceiling than the Sandilands house, with six 130+ games this year – 2nd most of anyone in the comp! The AFL’s best Katy Perry Impersonator has his good and bad days – why not get on and hope he’ll produce that big one? He has 3 scores 51 or lower, but 4 scores of 125 or above. Got barely any moolah left? Consider Mastenbator, who is only $182,100 and coming off a career high 140, meaning he shouldn’t be the sub this week. I talked last week about how favourable the Hawks run home is. Unfortunately, they didn’t make the most of a good opportunity against the Bulldogs, who had nothing to play for. 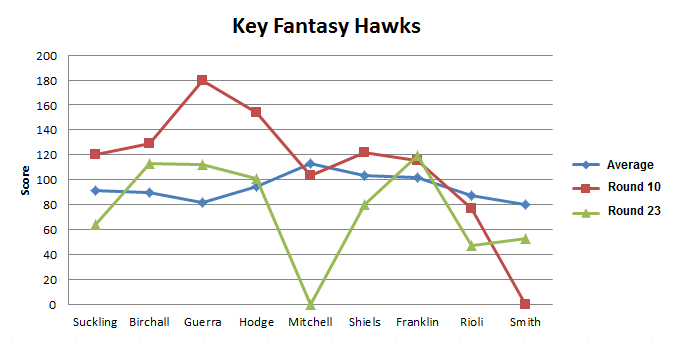 From the above graph we can see that the fantasy-relevant Hawks were well beneath what we expected from them this week, based on both individual form and their previous encounter. Collectively, that group of 9 Hawks averages 93.6 for the year. In that massive game in Round 10 this season, they averaged a massive 125.0 – so it is reasonable to expect something between those two in Round 23. Instead, they only averaged 86.1 as a group, and that’s not even counting the donut that Sam Mitchell’s late withdrawal created. Fingers crossed they’re back to their best next week against the Suns. Put simply, Tom Rockliff is a machine. He plays in an average team, in average games, but still managed to kick, mark and tackle his way to huge scores like the 151 he notched this week. He averages 28 touches, 5.8 marks and 5 tackles per game this season – the only player to average 25, 5 and 5 respectively this year. He’s also topped the ton in each of his last 10 games, an amazing streak. Absolute jet. Andrew Swallow continues to put his hand up to be fantasy relevant, and his 142 this round is a good offering to be considered. He’s a popular unique (excuse the contradiction there) because he can belt out these huge scores, although he is prone to the odd 50 as he served up in Round 20. If Dean Cox is rested this week, look no further than Sydney colossus Shane Mumford, who is having a bright finish to the year. His 146 last week and 135 most recently makes the man an exciting prospect for this week against the Lions. Yes, they have the Berger, but remember Ben McEvoy two weeks ago? Mumford will smash yet another A-grade ruckman in Sydney’s rampant end of year form. 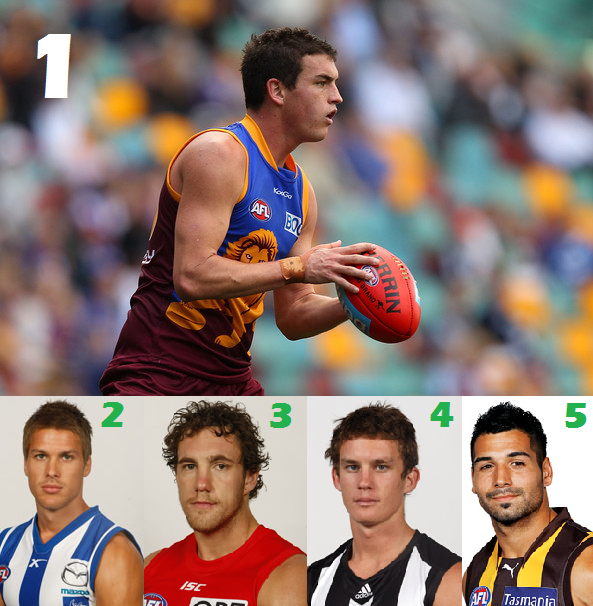 Ladies and Gentleman, Dayne Beams, for your consideration! Mini-Swanny has smashed it since his return from a leg issue, and is averaging 123 in his last four. With a few key Pies tipped to rest this week, Beams surely won’t be one of them and will reap the rewards. After a lean month, Paul Puopolo came back in style and was invaluable to coaches forced to play him due to Gibbs or Scotland or both missing with the bye. Career-highs in disposals (27) and marks (10) paved the way for his first-ever DT ton, a nice 129. Is Cyril Rioli closing in on a ‘Never Again’ berth? He can’t seem to keep fit, with a calf issue forcing him out of the game at the final change with only 47 to his name. I really hope Matt Suckling isn’t one of those players who lets you down in finals. A few years ago it was Heath Shaw, and we all know what his reputation is like in fantasy circles. It would be a shame if Suckling was seen in the same light so early into his career. 64 points this week following 74 a week earlier – hopefully we see more of his earlier work in Round 24. Isaac Smith is an enigma I’ll never understand. He performs well in poor conditions (90 against Freo in pouring rain), against the grain of a poor performance by his teammates (95 against North), but then something always pops up and gets in the way of a sure thing. This week it was a knock to his left leg early in the game that culled his score to 53. Andrew Raines is quickly becoming a tagger to be reckoned with. His recent scalps include Pendlebury (94), Ablett (106) and Dangerfield (50), keeping all of them to well below their averages. He added Andrew Embley to that list, who only scored 36 from just 7 disposals. Who will he go to next week? Is he athletic enough to go to Goodes? It looked like he was on the improve, but Jason Gram was back to his old ways against the Roos on Saturday night. He was considered a solid trade this week, especially as solid DPP cover with Gibbs/Scotland/Judd/Murphy out then Heppell/Watson/Stanton missing in Round 24. He managed just 35, only able to get it to his penetrating left boot twice for the match. Forget Girl Friends, it’s all about Grand Finals this week. 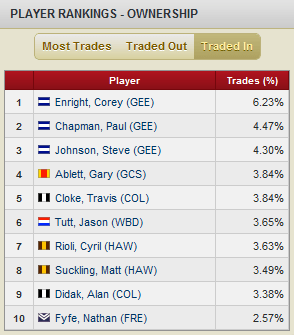 No Essendon guns, so trade or sub them away, and make your team the best it can be for the final round of 2011. Remember to get rid of Nick Lower too, who is the first player to do a ‘Sylvia’ and a ‘Judd’ in the same week. Surely that’s a good thing you say? Well, it’s not. He will be rubbed out while smashing out a huge score (116) like Sylvia, and he’ll probably miss the first 3 games of 2012, similar to Judd two years back…. Nick Lower, never again. This week’s biggest game is obviously the rest-fest between the Pies and Cats for the top of the table clash. Will they care about momentum going into the finals or play it safe? Carlton and St Kilda also looks to be important – I’m predicting not many points out of a tight battle. And of course, Hawks play the Suns on Saturday, so let’s hope there will be a fantasy smorgasboard there! P.S. There WILL be a Round 24 edition of the Bullets, with a recap of the finals, a few jovial awards to give out, as well as a sneak peek at the makings of Tbetta Than You’s 2012 mob! haha classic, an ex girlfriend of mine was forcing me to attend her mothers birthday do ON GRAND FINAL DAY, in 2006…..given that i am a west coast fan this was ludacris…..girlfrends come and go but premierships last a lifetime fellas. Mate, that is NOT ON! Glad she’s an ex! I reckon the Captain Vanilla blokes will be my starting midfield next year! hayes is the biggest gun!!! I think you guys will get a reality check when you pick that midfield and then try to find enough money to fill the rest of your team. I’m not sure if Barlow is going to be mid price. need the lord to smile on cox’s eye! Brilliant write up Tbetta! I enjoyed every single word, just as I enjoyed all 8 goals from Man U this morning. My maker this week was Zaha who single-handedly won me my prelim for my money league with 133 against his 70 from Lobbe. Also should I play Poo (129) or Broughton (62) this week? Looking beneath 380k, you have Fyfe, Rioli, Petrie, LeCras and Neon. You obviously don’t want Fyfe or Petrie, and Rioli has question marks over him. LeCras could go bang, but he could just as easily push 140 – Neon is the same, and he’d be very unique. So if you need to be Courageous, I’d be looking at them. To be honest, I’d probably play Puo. I’m sick of Broughton’s disinterest and ailing body, and I can rarely see him scoring 70 or more – at least we know Puopolo has a nice ceiling, and against the Suns, who knows?! Lucky enough to make 4 GF’s out of 5. No weak links in my team as long as they all play this week. Able to bench Gilbert, Broughton and Mzungu and use these guys as emergencies. Also my best overall ranking of 1600 odd after 4 years in DT. Thanks to DT Talk website and all the great advice and interesting reads over the season. Just relised something. Whatever happened to that secret squirrel guy tallking about his mid-price team? I noticed that the other day too… Maybe his absence is proof it doesn’t work? Im starting with a few next year. Haha sure you are… I’ve beaten the Jets before, hoping it will happen again! Well, how many trades do you think I have left? Disclaimer: Any previously mentioned IOUs are invalid until 5/9/11. So when then they put in their injury list at the beginning of the week they had already told Mitchell him he was too sore to play yet they didn’t disclose it. Then on Thursday having told Mitchell he wasn’t playing the previous Monday they still name him. Surely the AFL has to react to that?! Nice write up Tbetta, heaps of info in this one. Hope it helps me, made 4 of 4 GF’s (plus 3 of 3 in SC). I think I just imagine everyone with a penetrating kick is a left footer – ie. Luke Hodge, Lindsay Gilbee, Trent McKenzie, Mark Nicoski, Josh Hunt… list goes on. Haha…….you have a fair point with that list of lefties!!! Gram definitely right footed though. Enjoy the off season mate, see you again in 2012. Oh I was under the impression he was left-footed? Read somewhere he was. Yep, they come under ‘the list goes on’. Thomas suspended for two, Lower out as well. Im thinking that Daisy out means Pendelles and Swan more likely to play? Swan was never going to be rested, Pendles is the one i am concerned about although Mick did come out and say today that he would not be being visited by the general. 4 days of interpreting what Mick Malthouse said. As always, he twists and turns and talks in riddles. We need to treat the Geelong game like a final and prepared for it appropriately including structures but that doesn’t mean we need to put the best 22 on the field. Risk has to be pendles doesn’t play. Everyone keeps talking about Cloke being rested, but do you need to rest a forward? I wouldn’t think so and they better not rest Jolly. Looks like Cox is ok though. What should I do with my last trade? Am thinking Pav > ANY FWD or Sylvia > ANY FWD that is 402,800 or less? He should carve up Brisbane. Love your work, tbetta! You have helped make this site what it is this year! +1 Tbetta, you’re write-ups are god-like! ..but thanks to you too, Warnie! Without all the help from your site, I don’t know where I would be in my first year of dream team. Well, looks like this comment well be going on my resume…. Your right he is the Poo. Have $36,000 in the bank with only 1 trade. Other options: Bock, Adcock, Broughton. Current backline is: Gibbs, Enright, Birchall, Goddard, Deledio and Fisher. So who should I get, Carrazzo or Suckling, or one of the other options? BTW great article by tbetta, really enjoyed it. Hawks play GC so suckers yet I would be very tmapted by Bock as form has been better. Toss a coin. Great work tbetta. A great read. Simple and to the point with spot on analysis. In a spot of bother this week as have to jump in the car Thursday arvo (before teams) and head interstate for family commitments. Shocking timing but will just have to hope can get some internet access on Friday. Even if I have to door knock or I might have to visit the local school. Small town so options limited. Have one trade left and if its like last year will be decimated by the general. Only in one final in an unknwon league but a wins a win. Starting to have DT withdrawl already. The first sign is a shaky trade finger. Good luck to all playing GF this weekend. It begins….Fyfe out. Source 6pr (harvey)…come on down Mzungu. Yeah i heard he was going to have early surgery on the shoulder get it right for next season. Fyfe to who this week? Im thinking Rioli he could destroy the Gc. Higgins should go well against Freo also. I haven’t found anything on the internet yet about this. Into a GF because someone decided to bench Big Nick. He was always going to do well against North Melb. 1st time all year he has been unique for me. Have had Sam Mitchell all year and will now make him captain for GF. Needs to redeem himself. Dont trust Pendles and Swan not to be rested or subbed. Traded in Neon last week and he got subbed. Thankfully he had the runs on the board. Also a unique pick as my opponent doesn’t have him. Bugger just got a source FYFE IS OUT!!! Grrr, just brought him in for pav, i had sylvia too. Petrie gets a gig now.